As a student of both geology and biology, it’s exciting when I hear about research integrating these two very diverse fields. So I’ll report a bit of paleontology news for this first week. And there’s not a topic in paleontology much more exciting than dinosaurs right? Dinosaurs were a great subject to draw when I was in elementary school in the 90s because, as my art teacher cheerfully pointed out, “nobody knows what color they are, so you can color them however you’d like!” But the future of interpretive dinosaur drawing is looking a little less optimistic for children today, thanks to a study published online in Nature this week. An international team of paleontologists from the Institute of Vertebrate Paleontology and Paleoanthropology (Beijing), the University of Bristol (UK), University College Dublin and the Open University (UK) revealed the first ever evidence for the color of dinosaur feathers. Yes that’s right, feathers. The feathers were those of early Cretaceous Therapod dinosaurs, a group thought to be the evolutionary stem group of modern birds. The suborder Therapoda contains those famous carnivores Velociraptor and Tyrannosaurus rex, but some of the group’s genera were rather less daunting. 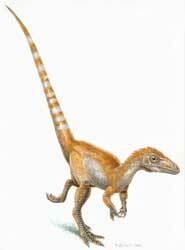 For instance, Sinosauropteryx measured only ~27 inches in length. It had simple feather-like bristles, precursors to flight feathers of modern birds, running down the length of its back and tail. It was in fossilized remnants of these bristles from the Liaoning province of northeast China that the paleontologists found clues to their color. Pigmented organelles called melanosomes give color to the feathers and hair of modern birds and mammals, and because they are imbedded within a protein structure, they are highly resistant to deterioration. Although the pigments themselves had long since decayed, the team used powerful scanning electron microscopy to recognize surviving melanosomes by their shape in early Cretaceous bird and Therapod fossils over 100 million years old. The fossils contained two types of melanosomes; sausage-shaped eumelanosomes, which contain black pigment found in the stripes of zebras, and spherical phaeomelanosomes, which contain the red pigment of red tailed hawks and some human hair. The distribution of these melanosomes led the paleontologists to believe Sinosauropteryx had alternating bands of orange and white feathers down the length of its tail! The study also reports that individuals of another small Therapod genus, Sinornithosaurus, varied in color from orange to black. More importantly, such findings further strengthen the argument for the evolution of birds from Therapod dinosaurs. The identical morphology of melanosomes from Therapods to very early birds and modern birds confirms that these bristles are related to modern flight feathers and not, as some skeptics believe, partially decayed collagen fibers. Such evolutionary progression also suggests that feathers evolved before wings and therefore must have served some purpose other than flight. Sinosauropteryx only had feathers running down the crest of its back and tail, so they would have had limited function in insulation. Mike Benton of the University of Bristol believes these dinosaurs were making a visual statement, noting that, “you don’t have an orange-and-white striped tail for nothing”. The study found no evidence of other colors such as purples, yellows and blues. The proteins producing these colors degrade more easily than the black and orange pigments protected in organelles. So it seems that the dinosaur coloring books will remain largely open to interpretation, at least for now. The Paper: Fucheng Zhang, Stuart L. Kearns, Patrick J. Orr, Michael J. Benton, Zhonghe Zhou, Diane Johnson, Xing Xu, and Xiaolin Wang. 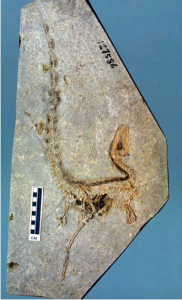 Fossilized melanosomes and the colour of Cretaceous dinosaurs and birds. Nature advanced online publication, 27 January 2010.